Start your day off with a healthy bowl of warm oatmeal, sprinkled with a dash of cinnamon and a pinch of brown sugar. Add a mixed berry smoothie comprised of Vanilla soymilk, Kirkland's Mixed Berry frozen fruits, one banana, and a little agave nectar for a sweet and satisfying drink. If you have a bit more time in the morning before work, treat yourself to a delicious plate of homemade french toast. Simply whisk an egg or two in a bowl and dip both sides of the bread in this egg mixture. Then, place the dipped toast on to a frying pan until it's slightly brown on both sides. Sprinkle powdered sugar before topping it off with your favorite maple syrup for a delicious and filling breakfast. Make this breakfast healthier by adding your favorite fresh fruits. Mine so happens to be strawberries, but you could also add sliced bananas or blueberries. Don't forget to wash it down with your favorite beverage in the morning. And yes, I definitely need coffee before I talkee, heh. One of my favorite breakfast items or snacks is a simple cinnamon rice cake. To add extra flavor to my breakfast, I spread my favorite dark chocolate peanut butter spread by Peanut Butter & Co. on to the rice cake and top it off with sliced bananas. Feel free to experiment with different spreads on your rice cake such as a peanut butter or white chocolate spread. Additionally, I paired my rice cake with one of my favorite organic San Francisco coffee brands otherwise known as Levity Brew. I've been drinking Levity Brew for several months now and I absolutely love its authentic and fresh flavor compared to other store-bought coffee brands. For those days when you don't feel like cooking, store-bought pastries are the way to go. My favorite place to purchase pastries from is 85C Bakery in Irvine and I absolutely love their coffee milk butter bread with chocolate chips on top! However, you can find pastries at almost any bakery or even in the bakery section of your local grocery store. 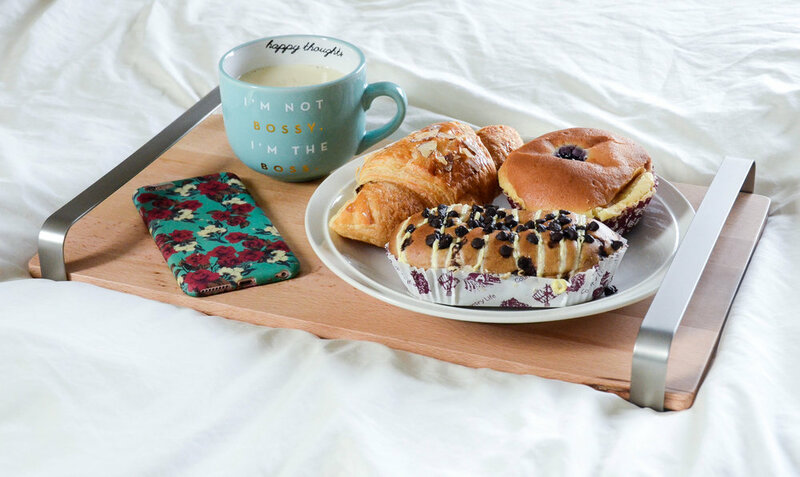 Pair it with your favorite morning beverage in your favorite morning mug! Slay the day by energizing yourself with your favorite box of cereal packed with your daily nutrients! My top cereal brands include both Honey Nut Cheerios and Honey Bunches of Oats. Personally, I prefer my cereal to stay crunchy for the entire meal so I pour my milk in a separate mug, as shown above. For an additional sweet treat, I know that cupcakes never disappoint - especially when it's from SusieCakes in Laguna Niguel! Since I do not recommend cupcakes as the healthiest option for breakfast, you can replace this item with your favorite scone, muffin, bagel! Ever since I tried avocado toast from Restauration in Long Beach, I have been absolutely hooked on making avocado toast at home. It's a really quick and simple recipe and serves as a filling breakfast. Simply take one avocado and cut it in half. Peel off the skin and place half of the avocado in a bowl. Now, start mashing it like you do with mashed potatoes! Eventually, the avocado will turn into a nice, creamy texture, which you can then spread on a piece of toasted bread. After spreading the avocado mixture on to the bread, sprinkle a pinch of garlic salt and pepper for an extra kick of flavor. Meanwhile, heat up the frying pan to fry a sunny side up egg. Top off your avocado toast with a freshly cooked egg for an aesthetically pleasing Instagram-worthy breakfast that tastes as good as it looks. Lastly, wash it down with a cup of orange juice and a delicious mini pie from Mixed Bakery! Shoutout to Mixed Bakery for making such a bomb raspberry pie. I'd like to thank IHeartAnKit for collaborating with me once again to help bring up my Instagame when it comes to making these delicious breakfast inspiration ideas. Their mug collection is seriously the cutest and I found myself smiling every morning when I grabbed any one of IHeartAnKit mugs from the shelf. I love the fact that IHeartAnKit carries both motivational and sassy phrases on their mugs to start your morning off with a bang. If I had to choose my favorite mugs, it would be a tie between the White Kitty Mug and the Coffee No Talkee wide rim mug. If anything on their website catches their eye, be sure to use my discount code "MISSCHELLE20" for 20% off your entire IHeartAnKit purchase. This discount code will definitely come in handy since the holiday season is upon us and the fact that mugs serve as the perfect gift for any occasion or person! Now that I've shared my top favorite mugs from IHeartAnkit, I wanted to give FIVE lucky readers a chance to win their very own KITTY MUG! Peep the rules below to find out how to enter. 1. Follow @missmisschelle and @iheartankit on Instagram. 2. Like this Instagram photo. 3. Tag 3 friends on Instagram who would be interested in joining this giveaway in the comments section of the Instagram photo. 4. Like my Facebook page (Search "missmisschelle"). 5. Leave a blog comment below mentioning which kitty mug color is your favorite! Don't forget to leave your full name, email, and Instagram handle in your comments.